Photo measuring approx. 3.75 x 5.25 inches, mounted into a cardboard folder which I have cropped out of this scan. Photographer is Morrison of Chicago, Illinois (Champlain Building / N.W. Cor. State & Madison Sts.). Otherwise undated and unidentified. I was unfamiliar with this style of children’s outfit, the white tunic/jumper thing with the loose dark belt, until I started collecting photographs. Then suddenly I kept seeing them everywhere in my collection. (This one was a gift from my sister, whose then-aunt-in-law was, conveniently, an estate dealer.) I think the look is odd but adorable. I believe this photographer is William McKenzie Morrison, who was famous for taking photos of celebrities, particularly actors, in his studio in Chicago’s Haymarket Theatre. But one source I found online said he moved to this location in 1899 and was only active in photography for a few more years before becoming too sidetracked by other business interests. If that information is correct, then is it safe to assume this photo is from the early Edwardian era? Wow, interesting. The one on the right really reminds me of young Titanic survivor Michel Navratil, with his little curly, peaked-in-the-middle hairdo (Michel is on the right here: http://www.shorpy.com/node/1367?size=_original ). 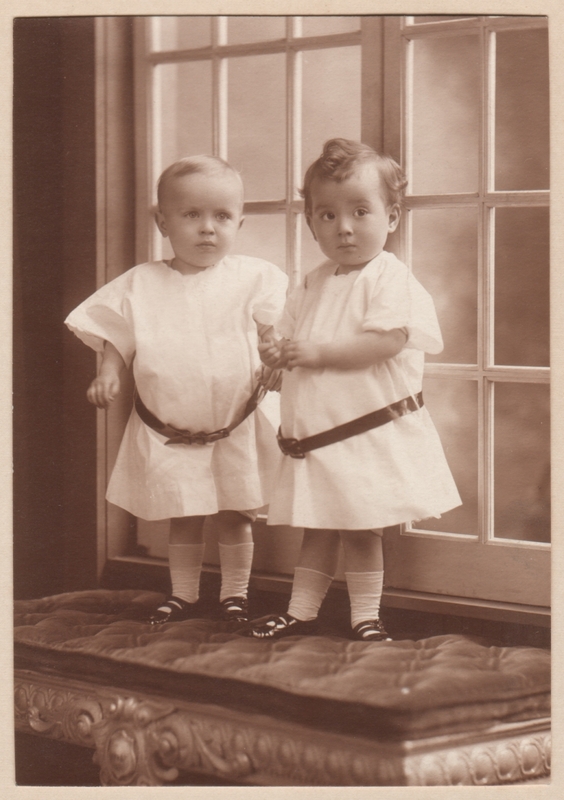 Of course, now that I’ve thought to look up 1898, I can see that his outfit was standard (http://1oet.com/wp-content/uploads/2012/04/cute-children-kisses-6.jpg ); I’m guessing the belt shows the evolution of infants’ dress, from the 1890s to the 1910s (or so? ), but it doesn’t seem to have much purpose, other than adding visual interest. Thanks for the links. I tried to do an internet search to get a better idea of how traditional they are, or what specific period they belong to, but I wasn’t even sure what to call them. And that photo of the Titanic survivors is adorable.